Mrs. Haggerty tells Martha Berry that she is sending over 200 Christmas cards and asks if they will be of use to the school. She also says that she enjoyed the movie of Martha Berry and wishes that more D. A. R. members could see it. 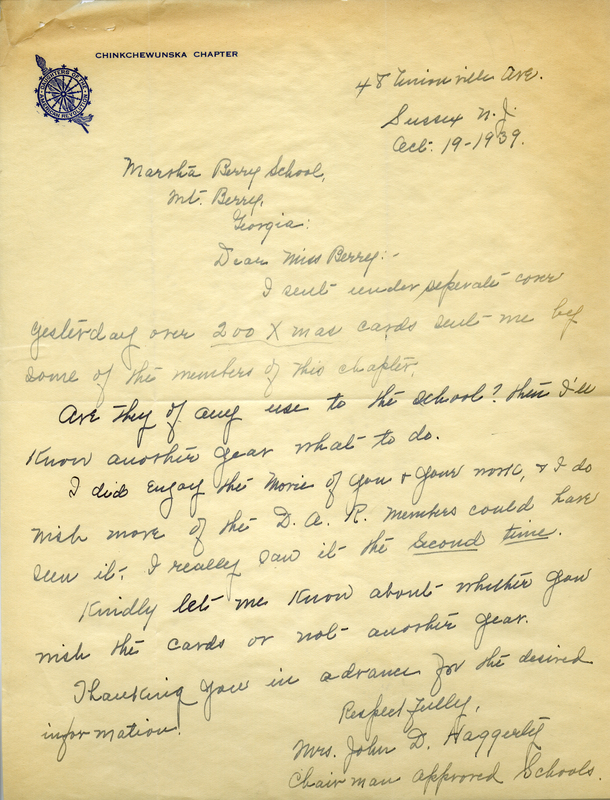 Mrs. John D. Haggerty, “Letter to Martha Berry from Mrs. John D. Haggerty.” Martha Berry Digital Archive. Eds. Schlitz, Stephanie A., Cassie LaJeunesse, Jessica Hornbuckle, et al. Mount Berry: Berry College, 2016. accessed April 23, 2019, https://mbda.berry.edu/items/show/14687.